Simon J. Williamson is a versatile Star Wars castmember. 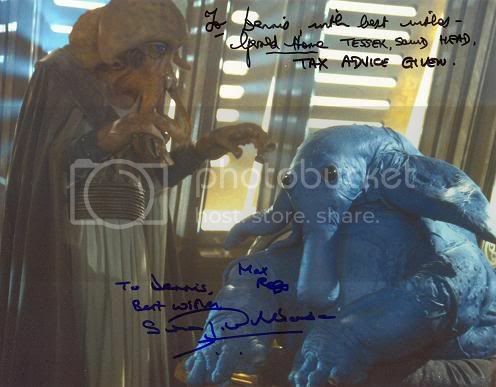 He played three parts: a Mon Calamari, a Gamorrean and the star of the Max Rebo Band: Max Rebo himself. 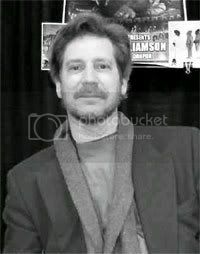 Besides Star Wars, he is known for his work on the cult-classic The Dark Crystal, made by Jim Henson and Frank Oz. I have met Simon three times within one year: in the fall of 2005, the winter of 2006 and the summer of 2006. The following interview was also done in 2006, and is an exclusive for this website! 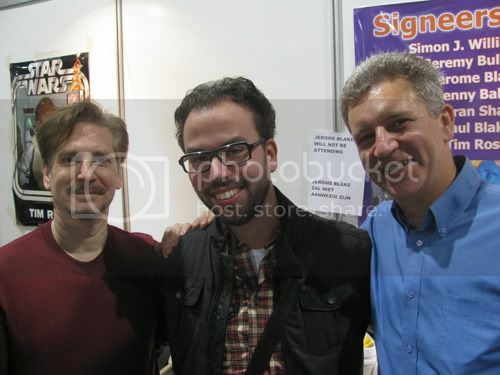 Left to right: Simon J. Williamson, me, Tim Rose (Admiral Ackbar) @ Collectors Fair Utrecht, the Netherlands, november 21st 2009. 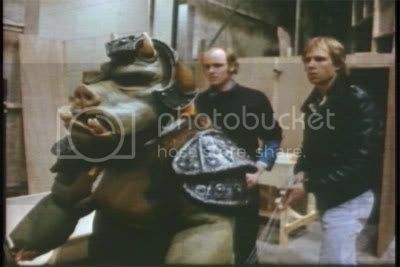 On another day, Hugh Spight and I saw some extras having difficulty keeping themselves upright, without fainting under the studio lights, in the large Gamorrean guard costumes. Having been in The Dark Crystal under even more physically difficult conditions, we decided to offer ourselves up. So we each got into a "pig guard" costume and terrorized Howard Kazanjian. looking over Richard Marquand's shoulder, although not obtrusively, but he didn’t say a lot directly to us mimes and puppeteers. Well, they were also The Dark Crystal friends, and it’s the convention circuit that has brought us all back together again. That was one of the best things about "Inebriation 3" - I’m sorry, I mean Celebration 3 - meeting them all again, along with Dave Barclay and Toby Philpott from inside Jabba. The days on Nien Nunb were actually quite disorienting, as the cockpit was mounted on a sort of gimble, which was rocked back and forth by a couple of grips to simulate it’s troubled flight through space. I think we were ok, but Billy Dee Williams (Lando Calrissian) was getting "space-sick", but of course, us puppeteers are a tougher breed than these actors. 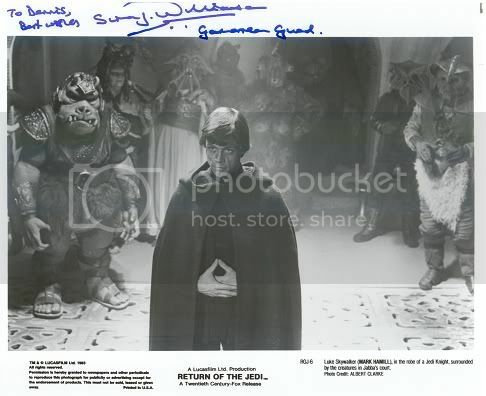 Laughing away inside the Gamorrean Guard costume, at the sheer absurdity of what I was doing and also being shown round the set for the first time by someone who thought they were only possibly going to use me on the film, when in fact I had already been signed up. 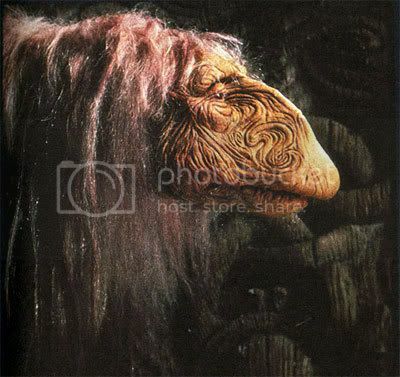 At each sound stage, people came over to say hello, recognizing me from The Dark Crystal, which was shot at the same studio six months previously. "Er.. I guess you’re hired, then" he said, after this had happened a few times. It’s strange to think that he died so long ago, now - and maybe this proposed The Dark Crystal sequel will remind everyone just how groundbreaking the original was. On the set of The Dark Crystal I saw a unique bit of performing by Frank that literally made my skin stand up - the moment when his Skeksis was cowering against a wall, being mobbed and stripped by the other Skeksis. It showed just how good puppetry can be. I regarded myself as more of an actor with movement skills than a top puppeteer, but on that day on set, we were all in the presence of something incredible. Now that I’ve started directing, I’d look to Frank as an inspiration for directing, too - one of my favorite comedy films is his Dirty Rotten Scoundrels. 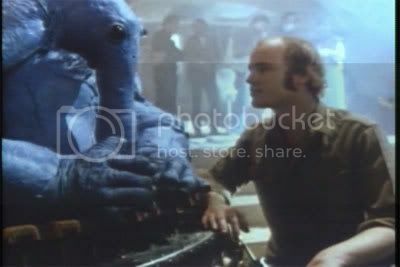 Obviously George Lucas has staked his position in regard to CGI , but for me there’s nothing like being on proper set and having real characters that actually exist in space - even though they may be foam rubber and latex, with a human or body underneath. For me it feels real, whereas CGI generally doesn’t feel quite right. You can admire it and go "wow" for a moment or two, but ultimately something creeps into the back of your head and you cant totally accept it. In my opinion. I’m trying to become a writer and director. I’ve made a few shorts, including one - The Right Hand Man which went to DragonCon in Atlanta one year - it’s world premiere, as it happens. That was a rites of passage story set in a gambling community in Wales. It’s a comedy drama and is a little under 18 minutes long. It was a The Cannes Film Festival this year, as was I, but has pretty much had it’s festival exposure now, although you can see some stills and a synopsis on my website (www.simonjwilliamson.co.uk). I’ve also written a screenplay set in London and the Isle of Man. It’s a comedy about an actor who appears in a low budget film, which indirectly causes a series of other disasters in his life. It’s a little like Martin Scorcese's After Hours in tone. I’m putting that out to the Industry, to try and get it funded. My main focus is therefore less on acting these days - but Id like to see if there’s anything I could do on the Star Wars TV series and The Dark Crystal sequel - I read at one point that my character, UrSol, is meant to be heavily featured. Have there been any "negatives" since you’ve started appearing? I like politeness and good manners, so anything that detracts from that can be a drag - and that occasionally happens - but thankfully it’s rare. Most conventions are well-organized and both organizers and fans are respectful and interested, and very glad to have you. George Lucas tapped into something very special and archetypical. I know he used Joseph Campbell’s book The Hero of a thousand faces extensively, but he also did so with Willow - which was less of a success, so that’s clearly only part of it. lt was probably more to do with a passionate desire on George Lucas part to get the story out there, and written from the heart, and subconscious. There’s also the factor of what was going on in the world at that time. Wherever he was he first thought of Star Wars, then it was obviously a very creative time for him. Also – I believe - with the first film having no stars and a smallish budget, being filmed so far away from Los Angeles, there was less incentive for the studio to "over-manage" the production, leaving George freer to make the film he wanted. There’s also something powerful and iconic about Darth Vader - not only visually in terms of presence, but also emotionally - enough to carry dedicated fans all the way through to the final installment, over nearly thirty years.